IL2 Sturmovik BOS & BOM @ 27$ Each game! I would say, go and buy it now... since Il2 Sturmovik Stalingrad & Moscow are in special @ 27$ for the premium edition including the collector planes! You can also get some collector plane and special campaign almost half price! If you guys need any help after buying all thoses planes and games... feel free to hop on the JG1 TS IL2 channel. Rise of flight is 66% off for summer sale... Steam version! It's part of the Summer Sale - from June 21st to July 5th! 1) Is it both for $27? 2) Is it a non-Steam thing? 3) Do you have a link? You can get this through Steam or through the Store. I'd pick one or the other though. Unfortunately, I can't find a list of whats marked down, so you'll have to wander through and check things out. However, Battle of Kuban is still full price. And while Battle of Bodenplatte is marked down, but that's an early access discount and not a sale per say. Be careful. When you buy a Premium version of one of the "Battles" (Stalingrad, Moscow, Kuban, Bodenplatte), they come with 2 additional aircraft from the collectors list. So you don't want to double dip. For example, you can get the La-5 (series 8), the Fw 190A-3, the Spit Mk. Vb, the Hs 129B2, the P-40E-1, and the MC 202 through buying the Premium versions of the main packs. PS: the campaigns are on sale too. I did my post late last night and may have forgotten a few details for people looking to buy it with Steam or the IL2 web store! Hope you have all wanted info Luft... feel free to ask more, if needed! For info, IL2 Kuban, is now at 49$ for the regular game. Which of these titles are considered the most necessary? Is it all one uber-sim or are they separate? Didn't know anything about Kuban, Bodenplatte, etc. They can be used singly, but then you wont have the aircraft from the other sets and will only be able to participate when a server has those particular aircraft. Stalingrad and Moscow are the oldest. So, in theory, most servers will have something from them. We are flying more and more on Coconut Expert Server on Tuesday Night, and sometimes, the map and planeset is the Kuban map. It makes it hard to fly, when only a few of us have the planeset! So that’s why I bought Kuban for 49$ lately. Maybe a bit more than the 27$, But a great map and great set of planes. For most pilots, these 3 games would be a good buy! For the next games coming in 2018-2019, I would wait! Thanks for all the info, guys Sounds like the most viable option would be to get the first 3. No real time now to get started, but at least I'd have them. Anything specifically helpful I'd need to know to download and install them? Plan on getting them from the IL2 store, as opposed to Steam. S! Nope pretty straight forward, you purchase, DL the games, enter your email and password, and your good to go. Well, I bought the premium editions of BoS, BoM, and BoK (no additional planes at this time). I went to the "Download" section, and it downloaded a file called BoM.exe, and ran that. When done, it installed files named for Battle of Moscow, and shortcuts for IL-2 Sturmovik: Battle of Moscow. Is this everything? What about BoS and BoK? My profile shows that I have codes activated for all of them, but based on what's installed, it looks like only BoM is installed. Why does the "Download" button only give me BoM installer? It’s all tied together under the same executable. The easiest way I could tell you to verify is to load up the game and try the three different maps or quick missions for airplanes from each set. So in the future, say if I purchased BoBP, there would be no further downloads? Ah, when I started the game, it immediately began to download 8.17 GB of game client. DL crawling at around 1 MB/s from their slow DL server. At this rate, wondering if it will be done in time for FiF! It stuck there and never did close....I shut down the computer and started it back up. Should that thing be left to run in the background all of the time? In RoF, when you close the game, or actually once you launch it, the launcher disappears by itself. Is this normal behavior for IL2? 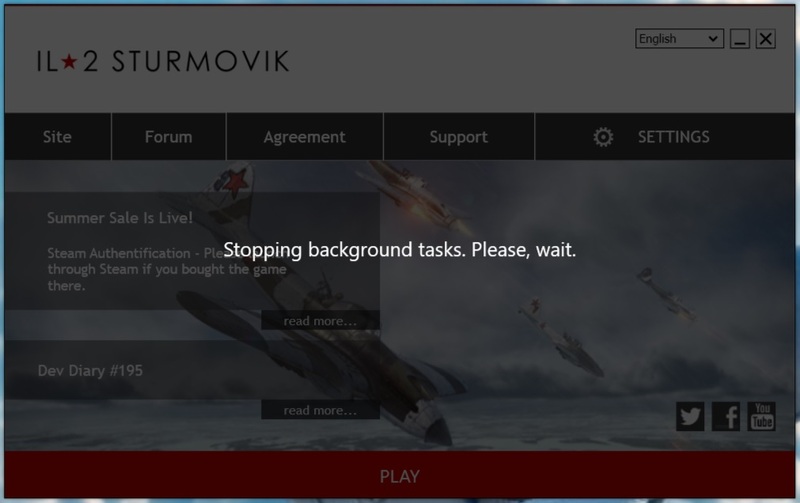 "Il2 Sturmovik Battle of Stalingrad\bin\game\Il-2.exe"
When the launcher hangs for me, I just close it through the task bar. Same here. Addition I make exe run as administrator. Thanks all, it seems to work OK now after restarting computer....at least as much I've had the opportunity to try it. Probably was just the result of starting the game right after the initial client download, before a reboot. I also had already found the .exe and picked "run as administrator" from the right-click menu. It already had a shield next to it, not really sure what that means, in the old days it would have a check mark if already selected. In any case, when I picked it, it ran the executable, so I'm wondering if you'd have to do that each time if you wanted to ensure that. Not having any problem anyway, and my only account is as administrator, so I think it's a moot point, regardless.